The newest baby on the chocolate block, & the only one grown in the USA – near the northern-most edge of the cacáo-belt. It has the climate (sort of), resources, & increasingly the know-how. Could Hawai’i be the Napa of chocolate? Cacáo arrived on these islands in 1850 along with sugar cane, planted by German physician William Hillebrand at the Foster Botanical Garden. But only recently has it really taken root. The California gold rush of 1849 largely saw to that & changed nearly everything on this Pacific isle. Miners back on the mainland grew a sweet tooth for refined sugar so the industry started raising cane…. & plenty of it, on a massive scale (as it had done for centuries on just about every tropical island it could conquer, displacing traditional sweeteners like honey; for a bittersweet account see Sweetness & Power: The Place of Sugar in Modern History by Sidney Mintz). It even plowed under native heiau temples & planted ‘King Cane’ over them. Before long an influx of Americans, Chinese & Portuguese outnumbered & overpowered native Polynesians who first settled Hawai’i & lived in accord with traditional ways, including he’enalu, better known as ‘surfing’. Considered an art rather than a sport, boards back then typically weighed 150 lbs & measured up to 20 ft long, demanding expert skills to master. It was reserved for the chief & the ruling class. As vacation-diarist Sarah Vowell points out in Unfamiliar Fishes, Hawai’i was Americanized by sperm whalers & Christian missionaries from Boston in the 1820s. The new immigrants rapidly insinuated themselves into the affairs of state. Eventually, aggrandizement of the “Merry Monarch”, King Kalakaua, by his U.S. sugar backers developed into dependency (they kept the money flowing which enhanced his prestige, as did the occasion that he was the guest of honor for the first State Dinner ever held at the White House – hosted by President Ulysses S. Grant in 1874). The sugar barons also lavished his successor & sister, Queen Lili’uokalani. And she wanted them until they no longer wanted her. Lili’ capitulated in 1893 in the face of a tiny but well-financed coup from the sugarcrats headed by the evangelical Stanford Dole, distant relative to the pineapple clan. 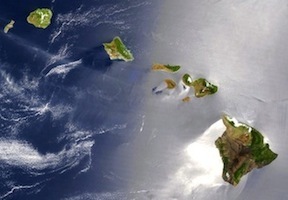 Within years Hawai’i was annexed to coincide with the beginning of the American Empire as it won the spoils from the Spanish-American War & took possession of Cuba, Puerto Rico, The Philippines + Hawai’i — all in 1898. by 1959 Hawai’i finally flipped into America’s 50th on the Star Spangled Banner – too small, defenseless & strategic to escape the grasp of an expansive USA. With backing from Hershey’s™, Chicago ad exec Jim Walsh resettled in Hawai’i to launch the modern cacáo industry in earnest after a long hiatus beginning in WWI when cocoa prices dropped & interest waned. Walsh founded Hawaiian Vintage Chocolate Company in 1986 based on selections provided by Ray Schnell. Included in the mix: cacáo from CATIE in Costa Rica, CRU in Trinidad plus more material out of Java, Brazil & The Philippines among others, totaling up to a dozen types in all (Amelonado, impure Criollo, Iquitos, Marañón, Purús, ICS-95, some of which contributed to the UH clonal series). These were planted on the Big Island at Kea’au. After initial success, repeat crop failures forced Walsh to all but abandoned his hope of establishing America’s first recognized cacáo estate. At the opposite western end of the island, medical professor Dr. Clarence Hodges grew cacáo on his one-acre farm in Keauhou under the tutelage of Walsh. After Hodges’ death 5 years later, Bob & Pam Cooper bought his farm & added a production facility that became the Original Hawaiian Chocolate Factory. It also operates as a small seed bank to local growers. Up to a dozen or more of them sell back their harvested wet beans to it for processing. In 2000, CTAHR (College of Tropical Agriculture & Human Resources University of Hawaii at Manoa, Honolulu) along with USDA & HARC (Hawaii Agricultural Research Center) began evaluating & propagating cacáo varieties as well as investigating diseases such as blackpod which first struck Hawai’i’s trees during the same year. In the wake of this research, the Dole fruit clan (remember them?) revived a 20-acre farm at Oahu in 2004. Kona Chocolate? Soon could be the highest priced bar on the planet. Four key drivers bode well: 1) lush topsoil in spots & accommodations for climate being so far north that include raising trees in full sun with the young ones wrapped in material to keep them warm, & irrigating the thirsty orchards; 2) high political stability & settled land claims compared to the rest of the world where cacáo grows, particularly in Central & South America; 3) likely absence of barriers surrounding patents & technology transfers, especially related to genetics. Skills & know-how, however, are embodied in people more than equipment hardware, software & patents so, most crucially, the ultimate key, 4) the drive & zeal with which Americans go after their pursuits, fueled by passion as much as by money. Cacáo in a sense could come full circle in Hawai’i to bring it home to the spirit of its Mesoamerican roots: planting, picking, & processing all done in situ by people with a deep appreciation, even love, for the ultra-exotics of chocolate.